Combining the flexibility of Push-Back with the density of Drive-In systems, Flow Rail® is the ultimate LIFO (last-in/first-out) high density racking system for pallets. While push-back systems typically consist of lanes up to 6 pallets deep, Flow Rail® lanes can hold up to 10 pallets deep with no incline or wasted vertical space. Flow Rail® lets warehouse managers stock up to 10 pallets in the same lane while mixing different SKU's in the same bay. Unlike drive-in systems, which on average stand 40% empty because bays need to be fully emptied for effective stock rotation, Flow Rail® makes each lane independent resulting in occupancy ratios in the order of 85%. Goods can be picked individually from any level without having to empty the levels above or below. It is very easy to extend or shorten the length of Flow Rail® tracks. When made longer, 100% of the existing material is reused. For extra wide sizes, twin-loading multiple tracks can be used. A third rail can also be added for weak pallets or very heavy loads. With Flow Rail®, different size and model lift trucks can be used thus eliminating the need for dimensional constraints on lift truck size for accessing drive-in bays. Flow Rail® can be installed on existing selective racks or drive-in systems. For new projects, roll-form could be used instead of more costly structural steel. The system also uses conventional fork-lift trucks. Flow Rail® systems are manufactured using a fully automated process and top quality low temperature resistant materials for years of reliable trouble-free performance. The risk of rack damage is greatly reduced since lift trucks perform all pallet operations at the front of the rack instead of inside. When operating in drive-in tunnel, lift truck drivers don’t always report the damage they can cause from accidental bumps that can weaken structures and increase the risk of rack failure and injury. With Flow Rail®, operators upload and unload from the face of the rack so there’s no driving in and out, thus limiting structural wear and tear while significantly reducing accidental risk. Flow-Rail is a chain system that slides on aluminum tracks. The first pallet is loaded onto the tracks. The second pallet pushes against the first one which makes the chains turn - subsequent pallets load same way. When pallets are unloaded, chains slide in the opposite direction. The driver uses the forks to tilt the front pallet. When the driver backs-up, the weight of the pallet being pulled plus the force of the lift truck makes the chains turn. 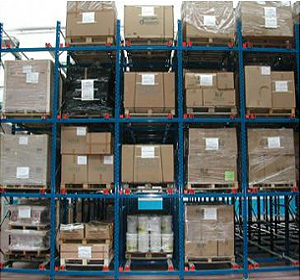 As the front pallet exits the system, pallets behind automatically come forward. 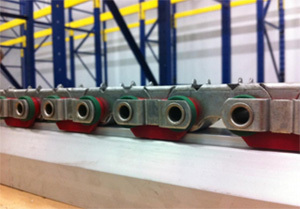 Flow-Rite will analyze your needs to determine if a Flow Rail® solution is the right for you.